The painters were back again today. Our weather has probably been playing havoc with their schedule this summer. 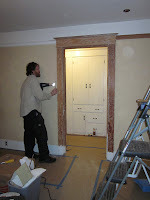 Today they put the second coat of shellac on the parlor and living rooms. We're told they'll be back tomorrow to finish the dining room. Jeff and Sharon got a late start today, but actually managed to make some good progress on the master bedroom this afternoon. 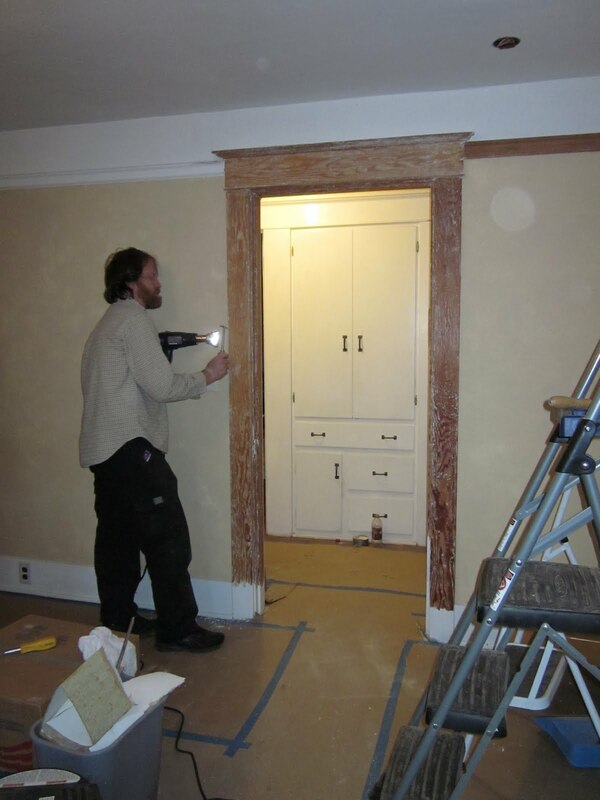 The first pass with the heat gun is nearly complete on the second doorway. And we got started on the floor baseboard, which seems like it would be easy but it is not. It's hard to use the heat gun down at that angle, so chemical stripper it's going to be. It takes two passes to get most of the paint. At least it's a sit-down job. We resisted sanding any of the woodwork in the bedroom today because of the shellac work downstairs. We have enough of a dust problem without adding to it at this critical time.